This week, Hawaii lawmakers voted to protect transgender people from public and private workplace discrimination, making the state the 13th (in addition to Washington, DC) to do so. Nevada's state Senate is considering similar legislation, and state committees in Connecticut and New York recently have as well. Another bill made some headway in Maryland before its Senate axed it. The activity highlights an often neglected part of the LGBT rights struggle. On Monday, I blogged about a study with the obvious conclusion that "LGB" (lesbian, gay, and bisexual) teens were more likely to attempt suicide when they lacked support networks. That prompted a reader to ask, "…why leave out the T? Were trans kids not part of the survey? Generally, it's LGBT, not LGB." Ninety percent of responders reported facing discrimination at work. Unemployment rates were double the national average. More than a quarter said they had been fired due to their gender identity. Those who had lost their jobs were four times as likely to be homeless and 70 percent more likely to abuse drugs and alcohol. And, perhaps most remarkably (and most related to Monday's post), 41 percent of responders admitted to having attempted suicide. 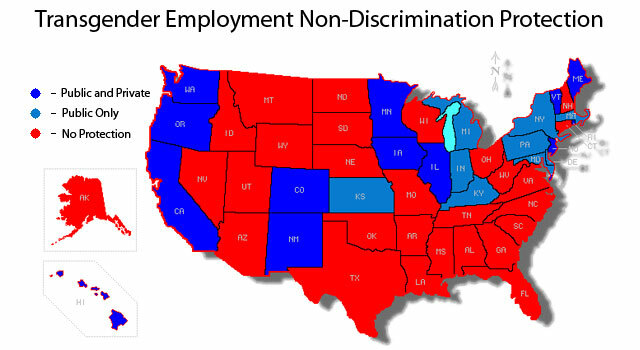 In addition to DC and the 13 states that provide full employment non-discrimination protection for trans people, nine states have executive orders that mandate protection for state jobs. (It would be 10, but Ohio Gov. John Kasich, a Republican, let an executive order covering trans people expire in January.) On the federal level, the efforts of Sen. Jeff Merkley (D-Ore.) and Rep. Barney Frank (D-Mass.) to establish workplace protection rights have stalled since 2007, although President Obama has voiced his support.